Duepicyou Shardstar was laboring up the winding lane toward the meeting hall when he heard a thin brittle scream. His six decade old heart, seasoned from three decades of adventuring, thudded in his chest as he oriented on the sound and pushed into a lumbering trot. Cursing his aching knee and twitchy back, he gripped the hammer on his side as he limp/stumbled up the terrace steps into the shadow of the village alchemy hall. He heard a female choking for breath as he skidded to a stop at the alley between two buildings. Though the afternoon shadows were long, he didn’t need details to know a bad situation; three on one, the smaller figure pinned to the ground gurgling for air. The nearest of the shadowy figures turned toward him. It was tough to make out, but it looked like he was wearing Corwinian army livery. That couldn’t be right. Corwin troops here in Marrowshire? Duepicyou sighed. Going down hill and picking up speed. He snugged his chain gauntlets, feeling their magic thrum through his arms. Was Donblas testing his faith? He hadn’t missed a prayer in three summers. The female, he was certain it was a woman now, cried and thrashed, calling for help. He drew a breath, worrying his boots in the dirt to make sure he had good traction. The two men not holding the girl, straightened and drew weapons. Duepicyou saw the flash, and listened to the sound of the metal clearing the sheath. The blades were mithril or tyrolian steel. Not swords wielded by common thugs. “Shoulda stayed out of this,” the tough said coming forward. “Stupid old—!” He thrust his sword at Duepicyou’s chest. The old cleric batted the weapon aside. Pushed his will into the magic of the belt and let its full power surge through him. “Amen!” He reversed the hammer, hearing the head whistle as it shrieked home with a crack. The man exploded backwards, skipping once before tumbling and smashing into the brick wall with an ugly crunch. He slid down the dirty stone leaving bloody streaks. The other attacker froze mid-step. 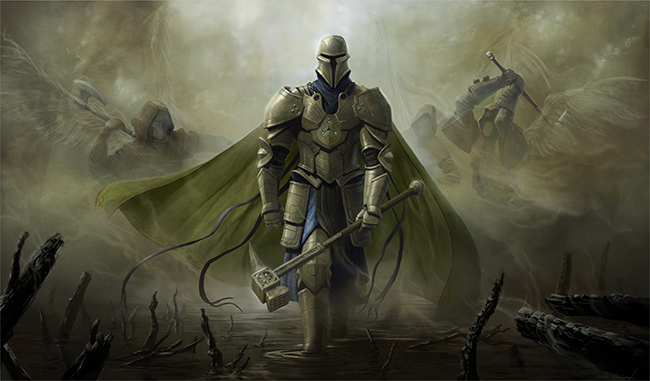 With a roll of his eyes, the old cleric leaned inside the sword cut and brought his fist and hammer thundering up into the attacker’s stomach with a thud. The force lifted the man off the ground, folding him like soggy parchment. He collapsed to the turf writhing and puking. The last attacker stood up and whipped out matching swords, spinning them and taking a stance.Duepicyou saw the runes glowing on the tangs of weapons. He did not mistake this man to be as weak as the other two. He obviously had skills and the time, why had he not simply killed the girl and left? He would worry about that later. The younger man moved in a blur. Duepicyou felt hits score before he sensed movement, only decades of battle instincts kept the two ravening blades from finding a vital. The man lunged out of the old cleric’s grabs twice and came in for the kill. Fast, young, experienced, and battle-hardened but not the equal of a man who had been to the bottom of the abyss and back. Giants, demons, spiders and drow, they had not taken his life, and neither would some gnave barely half way to his third decade. A slip-step, elbow, and reverse clipped the younger man’s shoulder with force enough to shatter a tree. The shock knocked the younger man careening into the wall. Coughing, the attacker rolled to his feet. A few rays of orange sunset struck the man’s masked face. He was indeed wearing a uniform, but the identifying insignia had been stripped off. The boots though… those were officer’s boots if Duepicyou had ever seen a pair; dorchy serpent leather, a Corwinian frontiersman. By the order, what was going on? “Who the frell are you?” the Corwinian asked. With a growl, the frontiersman reached inside his coat. There was a crunching sound and he vanished in a flare of blue light. Duepicyou glanced around noticing the two accomplices had disappeared as well. Nice trick. Definitely not bandits. Much to ponder. Returning the hammer to his belt he went to the side of the girl. Dressed in gray linen smock and leather boots, she wore no weapons or insignia. She was moaning and half conscious. The delirium did not appear to have been brought on by the assault. She was striking in appearance, thin and willowy with a pale hair and dark eyes. The coloring, eyes, nose, and mouth— none of the traits distinguished her as being from any of the lands he had been in. Too pale to be from the east, nose too prominent and thin to be from the south, and too round in the face to be from the north. Another enigma, though an attractive one. “Young miss, you are safe now, lie still and I will attend these injuries.” He chanted a healing prayer, feeling the energies of Donblas churn through his outstretched hands. Reddish light glimmered around her wounds. “Summer lane, on North Hill,” he responded. “Aye, young miss, Marrowshire.” He pushed to his feet with a grunt, feeling the ache of joints and tendons pushed by battle magic. He was going to regret this encounter in the morning. “Allow me.” He held out a hand. The woman blinked at him, face blank. After a moment, she pulled at the collar of her smock and she glanced down. “Jah…” She started and frowned. She rubbed at her neck brow furrowing. “Jahysee.” She repeated.